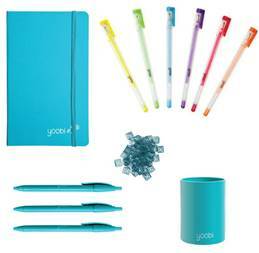 Yoobi has also created cute Teacher Bundles that you can gift to your teacher to show your appreciation for all that they do. I love my children's teachers and I appreciate all they do. If you feel the same, this Teacher Appreciation Day, let Yoobi help you create the best home-made gifts for your favorite teacher. Or better yet, give them the gift of fun and trendy supplies to use for their classroom. They have everything you need to spread the love. Here are just a few of our favorite products which are great for both home and school use. My kids had a great time making cards for all their teachers and teacher's aids using Yoobi's art supplies. My daughter's favorite's were the Twister Crayons. They have a finer point than regular crayons and are great for doing homework. They especially loved the stamp roller and got a little carried about with it. These awesome, colorful products are sold exclusively at Target and are also available at Yoobi.com. In addition to providing all these fabulous art supplies, Yoobi also gives back to the community. Many kids in the U.S. don’t have access to basic school supplies, unless teachers pay for them out of their own pocket. Through Yoobi’s partnership with the Kids In Need Foundation they distribute Yoobi Classroom Packs all across the U.S. to the kids that need them the most. If you'd like to learn more about Yoobi and all the products they offer, be sure to visit their website or follow them on social media. Right now, you can even get $5 off your order of $25 or more by entering the code FORTEACH between now and 5/3!